Cinnamon first appeared in Chinese writing in 2800 BCE, and has also been mentioned in ancient Sanskrit documents from southern India. Cinnamon (and its relative, Cassia) were imported to Egypt from China in 2000 BCE. Cinnamon oil was one of the ingredients to be used in the Egyptian mummification ritual. Description: Cinnamon is the inner bark of a tropical evergreen that is native to southern Asia. It has a thick outer bark, and small white or yellow flowers that mature into bluish-white berries. Its leaves give off a spicy scent when bruised. However, most of what is bought as cinnamon is actually from another tree relative, called the Cassia. While it has the same characteristics of proper cinnamon, the magical symbolism can be off, so pay attention to what you are using. Safety: The essential oil from cinnamon that was made from its bark is a strong irritant. Never put into contact with bare skin (trust me on this; personal experience taught me how true this is!). Essential oil used with the leaves is safer and better for use in craft, but it can still be a strong irritant, so dilute with water before use. Parts Used: Inner bark, essential oil of leaf. • Use in spells to help expand one’s horizons or to clear away limits, or for protection, lust, power, strength, or success. • Burn cinnamon for blessings, sanctification, happiness, love, or money. • Craft a sachet for happiness, love, or money. • If you are in need of quick cash, create a bowl out of cinnamon clay. Write on a piece of paper how much money you need, and add it to the bowl along with a few coins. When your working has completed (i.e., if your spell worked) bury the paper and coins, and your bowl is ready for the next money spell. • Use in tea for car sickness, cold, congestion, PMS, sore muscles, gas or bloating, vomiting, or diarrhea. • Adding cinnamon to dairy can make it more digestible. 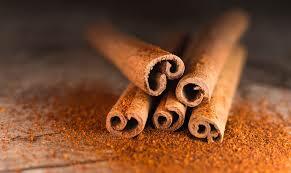 • Cinnamon is an antibacterial agent. • A cup of cinnamon tea after dinner can help stimulate digestion and aids in regulating blood sugar. Resources: Encyclopedia of Natural Magic by John Michael Greer, Witchipedia.